After crossing a few typical villages such as Linguaglossa, you will enjoy the varied views of the volcano and its unusually contrasting landscapes. As soon as you reach the North side of the volcano, (1800 mts) you will have the possibility to board all-terrain vehicles with an extra charge. 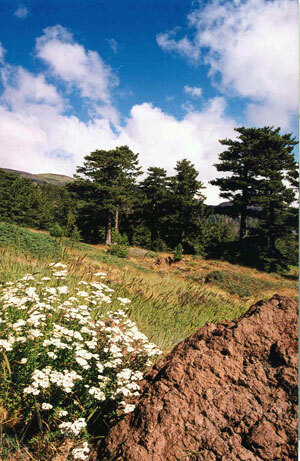 They will take you to the foot of the North mouth, one of the most active craters of Mount Etna. We will then drive you to the beautiful town of Castiglione, Francavilla and Motta Camastra where you can breathe the typicality of Sicily. The name Linguaglossa derives from the ancient term Linguagrossa referring to a grossa lingua di lava (a big tongue of lava) the name was later distorted accidentally. This is a reference perhaps to its vulnerable red hot position on the slopes of Etna down which incandescent lava has flowed perilously on several occasions. Founded by refugees from Naxos in 496 BC, Castiglione di Sicilia was destroyed by the troops of Syracusan tyrant Dionysius I. It was successively ruled by the Roman, the Byzantine, the Norman and the Swabian. During the Middle Age, it was a feudal belonged to Roger of Lauria. A number of relics scattered throughout its territory testify to its ancient past. Among these are the ruins of a Greek acropolis, of a small Byzantine temple, of a Saracen tower and of a Norman castle. Francavilla di Sicilia (Francavigghia) is a town in the province of Messina it has a population of about 4,000 people and is situated in the southern part of the province, close to the northern slopes of Mt Etna.